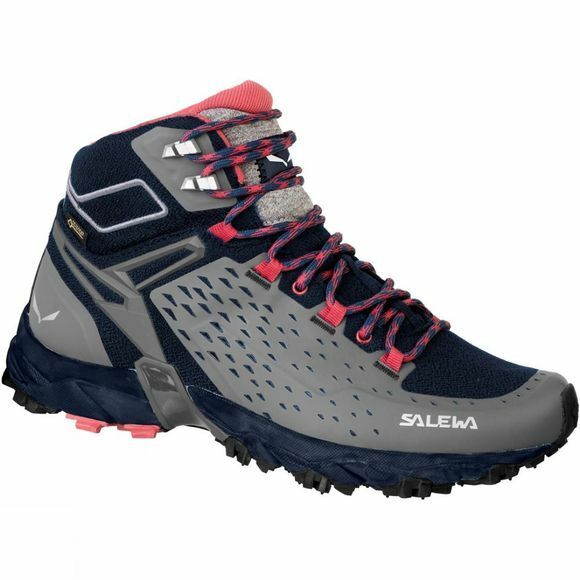 The Womens Alpenrose Ultra Mid GTX Boot from Salewa is a waterproof, breathable mid-cut shoe designed for speed hiking and high-intensity mountain training. Built around Michelin’s technical performance outsole, the special rubber compound features a design with grooves and sculptures for outstanding traction and stability over hard and uneven terrain. The lightweight, mid-cut upper provides good support and promotes natural foot movement and agility – especially on downhill sections. The Alpenrose Ultra Mid GTX has a Gore-Tex construction to keep your feet dry in wet and muddy conditions. The 3F System connects the instep area with the sole and heel, ensuring ankle support, flexibility and a precise fit.